1. Volunteer as part of the constant presence RHR and other NGOs are coordinating starting from Monday the 20th. This is first and foremost to be with the people of Susya during the demolition, and also to document it. Shifts are from the evening until the mid morning. This is the single most important thing you can do. 2. Put your name on a list of names of folks who are willing to run down there on short notice if necessary. We want to know who has a car, and whether they want to receive notifications by sms, whatsapp, etc. 3. Save the date for a DEMONSTRATION against the forced displacement of Susya on JULY 24. 4. We also request you to save the date of Susya’s High Court hearing – AUGUST 3. 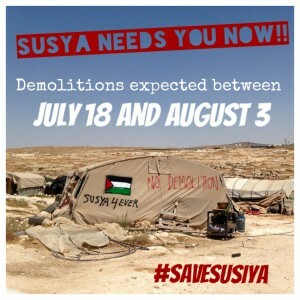 Please continue to share and post about Susya, using the hashtag ‪#‎SaveSusiya‬. Please, let’s not let this happen again! Video | This entry was posted in Uncategorized and tagged RHR, Susya. Bookmark the permalink.